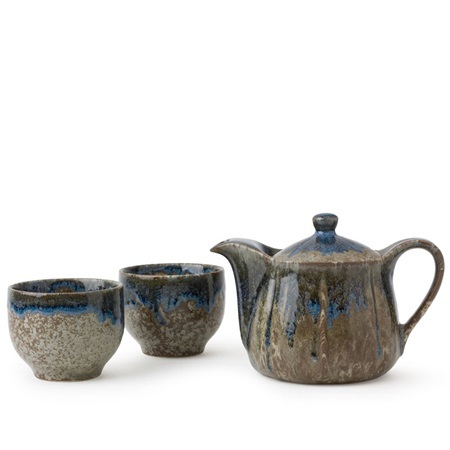 Beautiful teaset with a brown/blue glaze. Each one is different since the glaze is applied by hand and glazes tend not to behave the same way each time. Ahh, those silly glazes! Stainless steel strainer inside. Packaged in a black gift box. Pot: 6" x 4" x 4.25"h; 14 oz. capacity. Cup: 3.25" diameter x 2.25"h; 4.5 oz. capacity.